In the last decades of the 16th century the Carracci family – the brothers Agostino and Annibale and their older cousin Ludovico – led the reform of Italian painting by rejecting the excesses of Mannerist practice, inaugurating the first wave of the Baroque. They established an informal art academy in Bologna, placing great emphasis on drawing from life and the study of nature, incorporating these concerns into the creation of works of art with programmatic intention. Agostino is better known as an engraver than as a painter of canvases and frescos, activities in which his younger brother and cousin surpassed him. He trained first as a painter with Prospero Fontana and Bartolomeo Passarotti, then as an engraver under Domenico Tibaldi between c1575–81. However evidence suggests that he learnt how to handle a burin and engrave on metal before his involvement with Tibaldi. 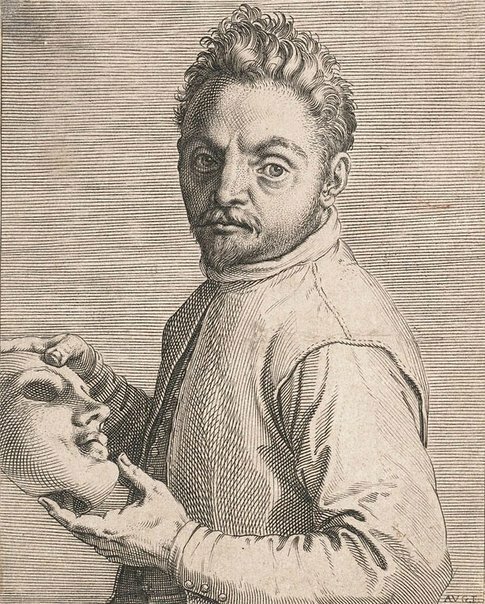 Agostino popularised the swelling burin line, a technique he assimilated from the engravings of the Dutchman Cornelis Cort, which transformed the field of reproductive printmaking in Italy. Reproductive engraving was a lucrative practice for Agostino, and many of his early prints depended on the inventions of a previous generation of Bolognese Mannerists. Agostino’s reputation as the leading reproductive engraver in Italy was established after visits to Venice and Parma in the 1580s where he made prints after the works of Veronese, Tintoretto and Correggio, which superbly manage to convey in black and white the painterly, atmospheric qualities of the originals. Later in his career, Agostino’s interest turned to engraving his own designs: portraits, heraldry, devotional images, book illustrations and erotica count among his significant output of original plates. The Portrait of Giovanni Gabrielli, called ‘Il Sivello’ is one of a small number of engravings produced during Agostino’s time in Rome between 1597 and 1600, while he was assisting Annibale with the Farnese Gallery frescos.It portrays the actor Giovanni Gabrielli, known as Il Sivello, leaning on a ledge and holding a theatrical mask. Gabrielli was an actor in the Commedia dell’Arte tradition, renowned for his impersonations of men and women. The sitter’s identity is engraved along the bottom margin in an elaborate script but this has unfortunately been cut away in the Gallery’s impression. In the unique first-state impression of this print at Chatsworth House, Derbyshire, only the sitter’s head and collar have been engraved while the torso and mask are lightly sketched in black chalk. Signed l.r., [incised plate] "AVG. F.". Not dated. Look , Heidelberg, Jun 1998, p 8. Prints & drawings Europe 1500-1900 , Sydney, 2014, p 44, col illus p 45.